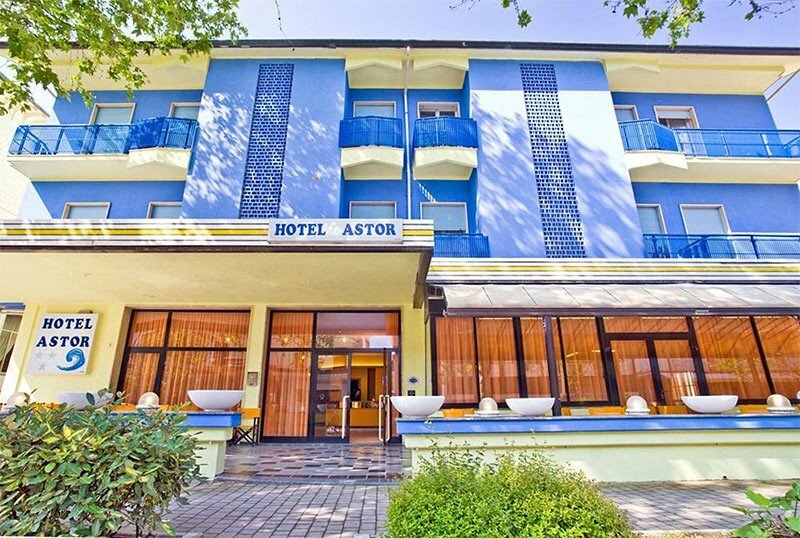 Hotel Astor , three stars on the border between Gatteo and Cesenatico, has many services designed for the needs of families and guests of all ages. It offers a swimming pool, playground area, secure outdoor parking and air-conditioned rooms. Pets are allowed. The hotel is located in a quiet avenue on the border between Villamarina - the southern part of Cesenatico - and Gatteo Mare, close to the beach and just 5 minutes walk from the Gatteo a Mare train station. The area is full of leisure opportunities for families and children: concerts, outdoor games, spaces designed for entertainment and local. The rooms have a private balcony (with the exception of single rooms), air conditioning, digital terrestrial TV, safe, private bathroom with box or shower curtain and hairdryer. Cots on request. FAMILY: triple and quadruple solutions with bunk beds are available. Swimming pool in the garden, children's play corner, outdoor open-air porch, terrace, hall, lift, bar, free use of bicycles subject to availability and possibility to rent for a fee. PARKING: exterior, 500 meters from the hotel, guarded 24 hours and free for all guests. LUNCH AND DINNER: Romagnola and vegetarian cuisine with three first and three second courses to choose from, with meat dishes, fish and buffet of cooked and raw vegetables, pasta and homemade desserts. OTHER: high chairs for children at the table. The property has an outdoor swimming pool with loungers, parasols and a play corner. You can have aperitifs on the poolside. Prices are per room per week in treatment of All Inclusive. - Any meals not consumed will not be reimbursed. - Payments are accepted via: Cash with a 5% discount on the total, Bank check, only if made on the day of arrival, Credit Card with a 2% surcharge for commissions.